Here again Astarte appears with Asherah symbols. She’s on a Lion and has Ibexes and snakes. Astarte and Ishtar are different ways of pronouncing the same name. Definitely the same goddess. 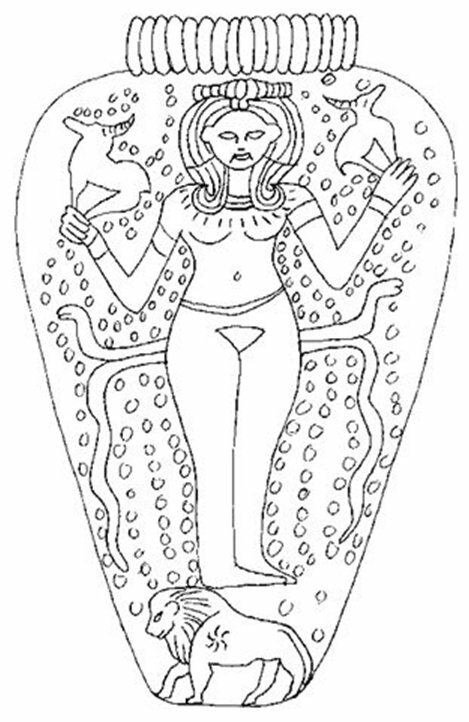 In addition to Asherah’s symbols of snakes, ibexes and the lion there is another symbol on this goddess that archeologists such as William Dever have associated with Asherah. She is wearing Hathor’s egyptian wig, which was also worn by Qudshu (Holy One – feminine), another goddess-name for Asherah. Hathor is depicted almost exactly as the image pictured here, standing on a lion, wearing the exact wig, holding a snake. Hathor is Asherah, says William Dever and other archeologists. He calls her Hathor-Asherah, and on an Egyptian plaque she is listed as Qudshu, Hathor-Asherah, Anat and Astarte. All the same goddess. Qudshu is the egyptian form of the word Qetesh, Qadesh, Kadesh, or Qadeshet. It means (Feminine) Holy One or “Holiness” in Hebrew, Canaanite and Egyptian. Wikipedia has a nice article about her under Qetesh. William Dever’s book, Did God Have a Wife? will answer all questions about Asherah and I highly recommend it. I couldn’t have completed this presentation without Dever’s wonderful book.